Long time no see, right? (I'm kidding, of course.) I am super happy as now is March and Spring is coming soon, and you know how much I love Spring. I love the warm weather, yet not too warm, I like long walks with my family or friends, or just enjoying a coffee on a terrace. 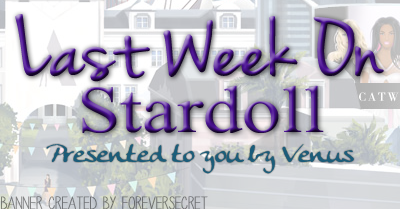 Back to the topic, we had a quite average week on Stardoll, some new releases, updates, an offer.. well read along to see. It started with a release of a new floor in Minimalism interior store. 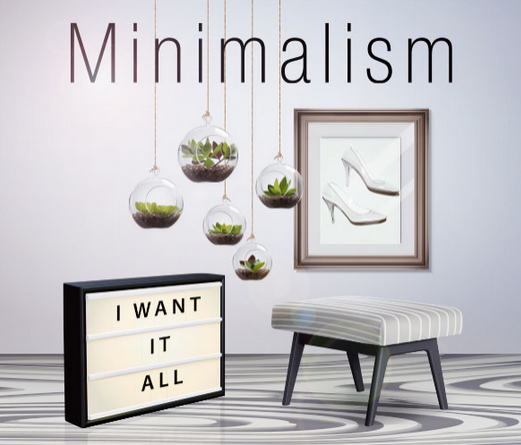 I believe this is the best interior store, as it contains basic pieces, which can be easily used in a minimalist themed room, or use a certain pieces to combine with not-so-ordinary furniture and add a nice, classy touch. Don't take my words for granted, I am not an expert for decorating suites. What I like is that, beside the clothing hangers, which we already had, we got purse hangers, jewelery stands, and a nice background we can use for displaying our favorite clothes. 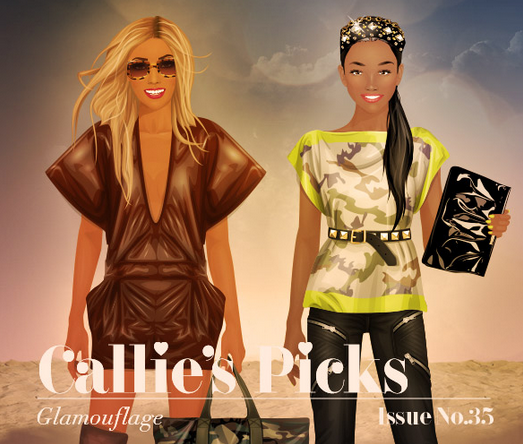 On Wednesday, we got another Callie's Picks collection (back to clothes in CP store), called "Glamouflage". The collection mostly focuses on military look, shades of green, some patterned clothes, and some ordinary items. I don't see many rares in this collection, which is, well good or bad, it depends on you. I am honestly not a fan of a theme, but I love the blue 'Atari Jeans', which are, surprisingly, sold in starcoins, so they are a great buy. What can we expect from next collection - another decor collection, or is Callie going back to re-releasing clothes only, the time will tell. On the same day, we got an offer from Stardoll, a rather nice, and a bit unusual one. So in order to get 25% extra stardollars, you had to buy a superstar membership package, topping up stardollars only didn't work. It was a fair offer, but I wanted to wait for the next month to renew my membership (which I did today), so I'm kinda bummed I missed it. 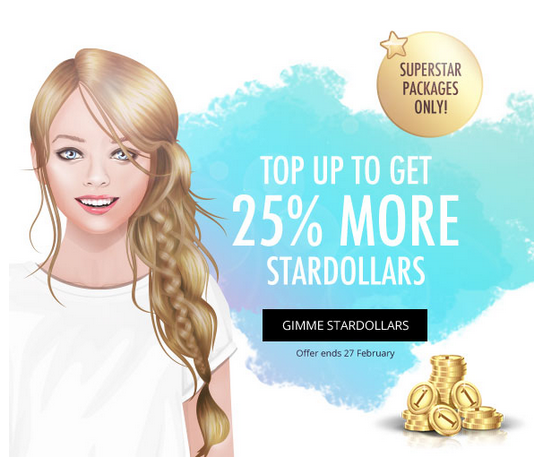 It is not too much stardollars, but a nice way from Stardoll to make us buy or renew our membership. I wish we got that hair instead, but I'd be bummed even more in that case, so..
On the following day, it was announced that Stardoll made some updates on some of a facial features. This is, of course, just a fraction of features that got changed, to see them all, visit the post here. Honestly, I didn't take time to check them. I have chosen my doll's features a long ago, and I plan on keeping them, as they are now part of my 'online personality', at least in Stardoll community. I know some members are angry that their facial features, which were part of their signature look, got changed without a warning. Stardoll just could have added new ones without changing the old ones. Oh, well..
On the Friday, we got an exclusive, Superstar only, (and Royalty as well, of course) collection in Jet Set store. The collection seems to be quite popular in Stardll community. I mean, who doesn't like luxury pieces, gold tones, and the exclusivity of a store? And I gotta admit, there are some really gorgeous items, but honestly, it is not so special. Aside from the 2 dresses shown on a pic above, I don't see many items I plan on buying, at least not soon. But sure, you can glam up, make a luxury themed room, outfit, whatever, options are endless, which I love about this game. And finally, we got a 50% off on a Nelly.com store - well, certain floors only. That's it for a week. I hope you had a nice one, either on Stardoll, or more importantly, in real life. I hope the following weeks brings us even more joy and excitement. Until then, vote, comment, and see you soon. Sneak Peek Callie's Picks "Clear_Skies_Ahead"
Another glitch or a new store? Stardoll Next Top Artist revealed!